Joseph “Blake” DeLoach always knew patriotism was in his blood. He joined the Army shortly after high school as a 19D Scout. He loved serving with his Brothers in Arms. On Oct. 18, 2010, the career he enjoyed so much came to an abrupt end during his second deployment. While on a mission with the 1-32nd Cavalry, 101st Airborne Division, in Kunar Province, Afghanistan, a rocket propelled grenade (RPG) struck Staff Sergeant DeLoach’s vehicle. SSG DeLoach lost his sight as a result of the blast, but he is thankful he was the only one in the vehicle severely injured. “That’s what made me accept what happened to me; that I was the one who took the brunt of the blast,” he says. Once back in the United States, Blake attended several blind rehabilitation centers, which led him to his now wife Lauren. The two met while Lauren was working at the VA’s blind rehab in Augusta, Ga.
Blake admits his road to recovery has been a rocky one. The frustration of losing his sight coupled with the emotional trauma of his experience caused him to self-medicate. He found solace in powerlifting and eventually got to the point where he stopped using all medications. He is now training to become a Paralympic powerlifter. His Seeing Eye Dog, Mason, has also expanded his ability to travel independently and cope psychologically. Blake has also taught himself to play guitar. He says he does not think of his injury as a limitation. He wants to try as many different activities as possible and be treated like everyone else. 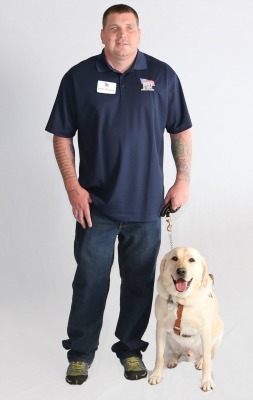 Blake says a specially adapted custom home from Homes For Our Troops will allow him to become more involved in the community and increase his independence. An open floor plan that is easy to navigate and an accessible shower will eliminate safety hazards. Most of all, Blake and Lauren are looking forward to the stability of a permanent home, something Blake has never had. “This home is going to free up a lot of time for us. It’ll give us a sense of belonging,” he says. Originally from South Carolina, Blake is choosing to build his home in Florida for the warm weather and friendly community. Blake says no amount of thanks can convey the gratitude he feels toward HFOT’s donors and supporters. “This opportunity will be life-changing and what you do really makes a difference in every Veteran’s life,” he says.